A picnic under the great pecan tree. Today is Pentecost. The coming of the Holy Spirit, Acts 2:1-21. Pentecost comes fifty days after Easter and is sometimes called the birthday of the Church. 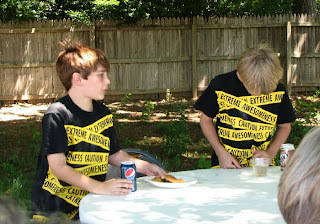 What better way to celebrate than with a spirited outdoor picnic. Hamburgers and hot dogs are grilled, filling the air with fragrant smoke. Side dishes of salads, baked beans, and scrumptious desserts are set out to complement the grilled meat. We enjoyed a warm sunny morning with a soft cool breeze. Susan brought a platter of her delicious deviled eggs and a Gooey Butter cake.. This one is for Clara. 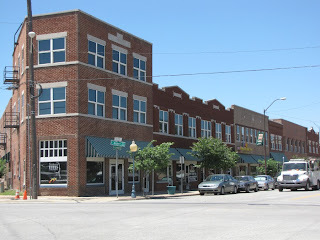 In the heart of what was originally Tulsa's "Black Wall Street" is a Black Heritage Center and the annual Juneteenth Festival. Just north of Archer on Greenwood Avenue an open area which is the site of the annual Juneteenth Festival. Replica's of the posters from past festivals are painted on the side of the overpass. This shows that graffiti can be art. Click to Enlarge. 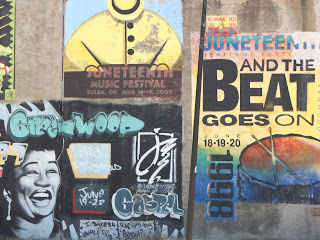 Juneteenth on Greenwood, a celebration of Oklahoma's African-American music traditions, began in 1989 under the direction of the Oklahoma Jazz Hall of Fame. 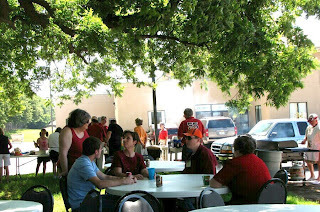 Every June that organization in conjunction with the North Tulsa Heritage Foundation hosts the free event, featuring local, regional, and nationally renown entertainers. 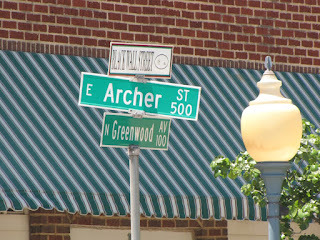 Greenwood Avenue, near the Greenwood Cultural Center, in the historic district of Tulsa once known as "Black Wall Street," serves as the central location for the outside annual celebration. Although Oklahoma came into statehood in 1907 and was never a slave state, it was geographically and culturally a Southern state. When I was a boy growing up in the small Oklahoma town of Wagoner in the 1940's and 50's racial segregation was the norm. I remember white and colored drinking fountains and waiting rooms at the train station, and attended an all white school system. The blacks in our town had their own school in "their" part of town. As a kid I felt no animosity towards black people, i just accepted the separation as normal. I was not to know a black person my own age until I was in college in the early 1960s. 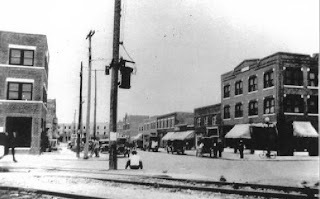 The corner of Greenwood and Archer in Tulsa was the center of what at one time was the most prosperous black business district in the United States. 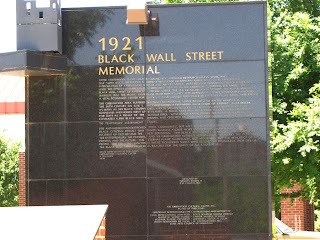 Before 1921 it was known nationally and internationally as the "Black Wall Street". I like Tulsa and usually try to show it in a good light. Today I will share a shameful part of Tulsa's history that many would like to forget, even though there are few living today who were part of that history. I would also like to add that the days of racial discrimination thankfully are over. In June, 1921 the area was the site of the worst race riot in the history of the United States. Many people prefer not to know this particular part of Tulsa's history. It is probably our darkest chapter. The financial prosperity of this area has never fully recovered. If you are interested in knowing more please see the excellent Wikepedia article HERE. I found this old photo and another interesting article. Look HERE. Looking North on Greenwood Ave from Archer Street just north of the old part of downtown Tulsa. Click to enlarge panorama. Greenwood is a neighborhood in Tulsa, Oklahoma. As one of the most successful and wealthiest African American communities in the United Stated during the early 20th Century, it was popularly known as America's "Black Wall Street" until the Tulsa Race Riot of 1921. The riot was one of the most devastating race riots in history and it destroyed the once thriving Greenwood community. Greenwood is still being rebuilt today because of the destruction over 80 years ago. 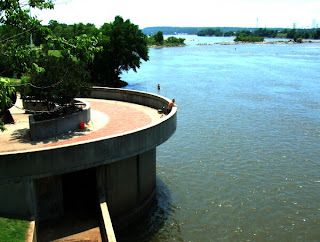 There are a number of good places to fish along the river. The prize catch is a nice Striped Bass. 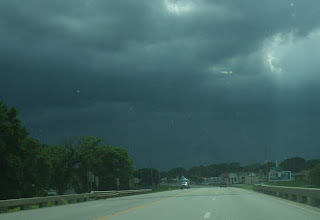 We are driving toward a rain storm. Although the road is dry where I am, 200 yards down the road is a hard rain. 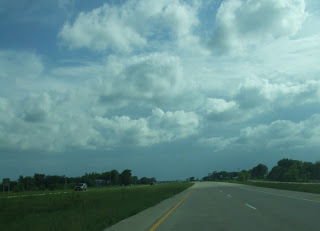 Click to enlarge the picture and you can see the dark line of rain on the highway just beyond the car in front of us. This time of year in Oklahoma there is always a chance of rain. Storms move in and out with little warning. The weather man on TV does his best but weather here is unpredictable. Our best source of information is Smokey the weather dog. Regardless of the weather forecast, when Smokey starts to shiver its getting ready to rain. Susan and I are trying to clean out our garage. That means going through boxes we have shoved in the garage to be sorted out later. Later is now. It has been a treasure hunt and we are finding things we thought were lost. 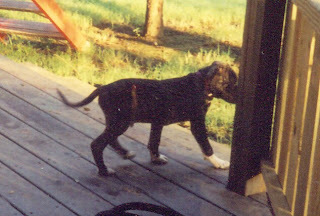 One treasure is a couple of photos of Smokey when he was just a little pup. 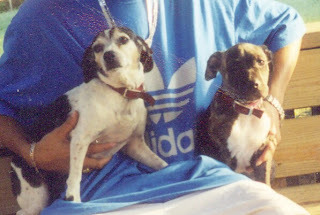 When Smokey came to live with me I had a little Rat Terrier named Tootsie. It is hard to recall the time when Smokey and Tootsie were the same size. Tootsie has since gone on to dog heaven, (if she is lucky). Smokey was born June 7, 2000 which makes him almost 9 years old now. These pictures were taken when he was about 10 weeks old. 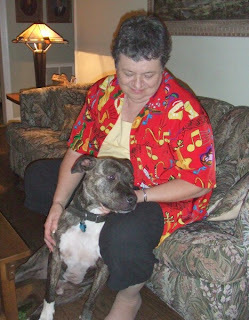 Since Susan and I were married December 27, 2002 that means Smokey has seniority on her. But there is no jealousy, Smokey loves her as much as I do. We will have a little birthday party for him soon. I visited the cemetery early on a June morning in 2000 after first walking the beach below. It was a very moving experience for me to walk among so many graves of my countrymen. They seemed to stretch on forever. I cannot look at these pictures without finding tears in my eyes. 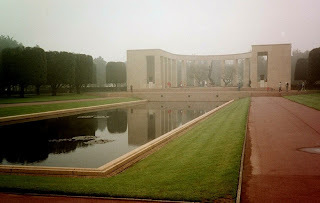 The Memorial overlooks a reflecting pool and the graves of 9,387 American dead. The names of another 1,557 Americans who lost their lives in the conflict but could not be located and/or identified are inscribed on the walls of a semicircular garden at the east side of the memorial. France has granted the United States a special, perpetual concession to the land occupied by the cemetery, free of any charge or any tax. This cemetery is managed by the American government, under Congressional acts that provide yearly financial support for maintaining them, with most military and civil personnel employed abroad. The U.S. flag flies over these granted soils. 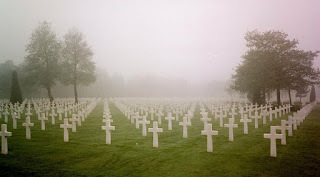 The cemetery is located on a bluff overlooking Omaha Beach and the English Channel. It covers 70 hectare (172 acres), and contains the remains of 9,387 American military dead, most of whom were killed during the invasion of Normandy and ensuing military operations in World War II. Included are graves of Army Air Force crews shot down over France as early as 1942. The graves face westward, towards the United States. 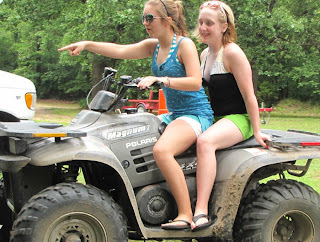 My granddaughter Sarah is 14 and learning to drive on the trails. She stopped to talk with us but preferred to roar up and down the hill on a big 4-wheeler. I don't know who it belonged to. She is growing up very quickly. Number 2 son David was in his house in town. He is working hard with some remodeling. 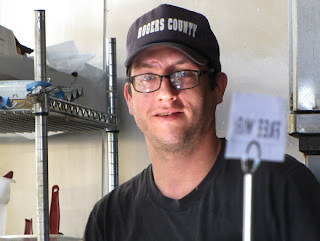 He and Renee will be married in a few weeks and he is trying to get his house ready for a new wife and her two girls. 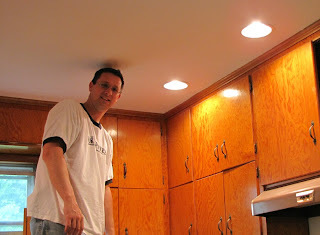 He is showing me the new recessed ceiling lights in the kitchen. He is making progress. 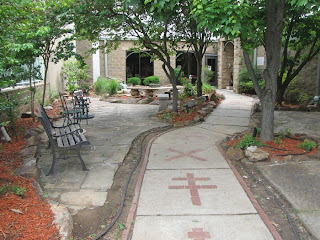 Our church has a lovely cloister garden recently renovated and refreshed. It is a lovely quiet place to sit and reflect. The walkway through the garden is set with brick crosses of various types and is a memorial of those who died in the tragic events of September 11, 2001. Memorial Day is a United States federal holiday observed on the last Monday of May (May 25 in 2009). Formerly known as Decoration Day, it commemorates U.S. men and women who died while in the military service. Together with the preceeding weekend it is an important 3 day holiday which marks the beginning of summer. The observance has become extended to include all those who have died and many families go to visit the graves of loved ones and decorate them with flowers or little flags. 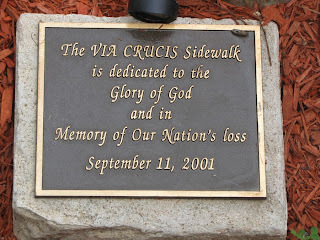 Our church, Christ Church Episcopal, has a cloister garden which contains several memorials to individuals and to commemorate the September 11 tragedy. Many families also use this as an occasion to camp, picnic, swim, fish and otherwise enjoy the outdoors. Sue, Smokey and I drove over to Ft. Gibson Lake near out home town of Wagoner to see what my boys were doing. Of the seven major festivals of the church, three come in successive Sundays: Sunday after the Ascension, Pentecost, and Trinity Sunday. 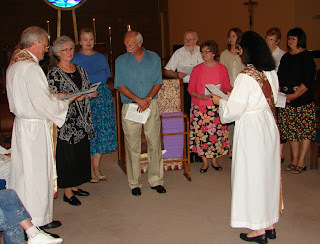 The other four -- Easter, Christmas, All Saints and the Epiphany -- get spread out over many months. 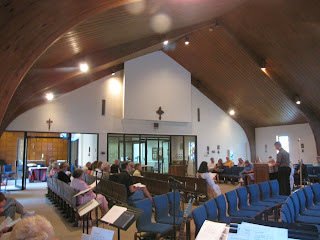 To emphasize the significance of these special days we arranged the nave into two sections. The congregation processed into the first section for the reading of the word, the prayers of the people, and for the sermon. 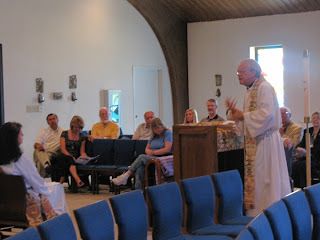 Then after exchanging the Peace moved into the forward section for the celebration of the Eucharist. The Yarnsters knit prayer shawls for those in need of prayer. Our friend David Pauling is going through a difficult health crises and received a shawl. 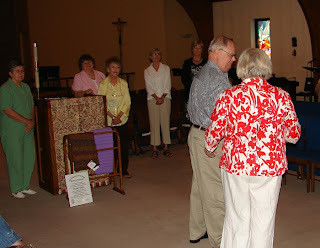 Frank Trayler recently completed Education For Ministry, a four year course of theological study intended to prepare him for additional lay ministry and was presented with a framed certificate by the groups mentors Angela Hock and Fr. Rick Brewer. 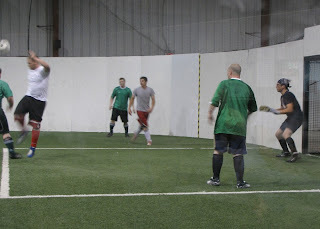 This was their first game and they may have been a little rusty but did well and had a good workout. It was fun for me to watch him play again . 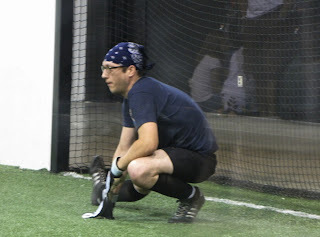 Luke played a lot of soccer when he was a boy, always as Goal Keeper. 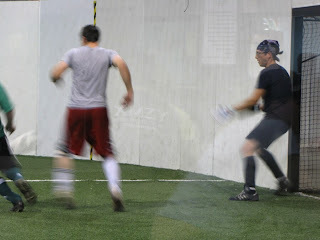 Tonight we watched Luke play indoor Soccer. 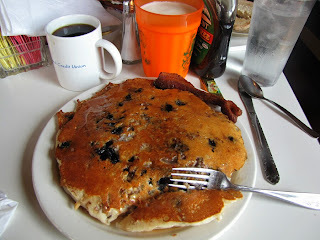 Serving his Dad the world famous Walnut Blueberry Pancakes. This one is for you Anne. 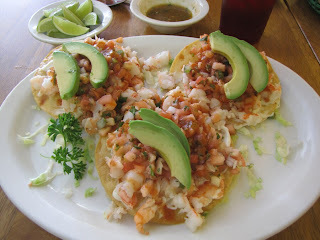 La Haciendo makes really good shrimp tostadas. Fresh boiled shrimp diced and tossed with pico de gallo and laid on a crisp tortilla spread with some mayonnaise. Squeeze a little fresh lime juice over it and Yum. Two were all we could eat so we have one of each waiting for us in our refrigerator. Susan treated us to lunch at our favorite neighborhood Mexican restaurant La Hacienda. 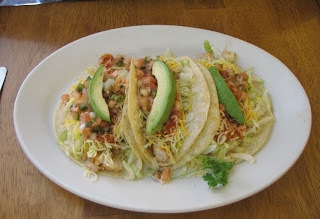 Here is her plate of three shrimp soft tacos. Of course I had to check on the nest. Looks like there are just 2 babies. 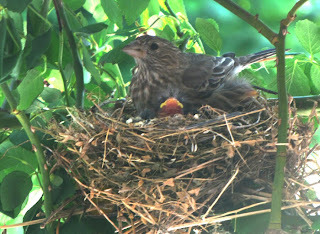 They are House Finches. Mother and father were both on the nest tending to the chicks when I peeked through the door. They flew before I could get a picture of them. These guys look hungry. When I looked again later I found the mother on the nest. I am looking through a small window in the front door as well as the glass storm door but it turned out pretty good. Without poking around I am not sure how many babies are in there, but I see at least three and another little blue egg. 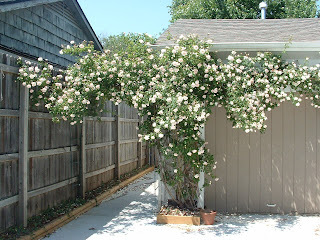 For the past several weeks I have noticed a birds nest being built in the canes of the climbing rose over my front porch. 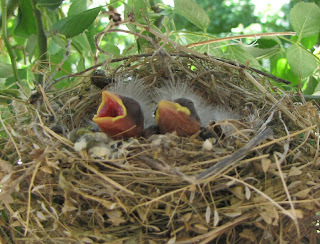 Whenever we open the front door the mother flies off and chirps at us from the maple tree in the front yard. 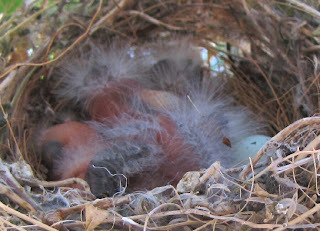 I didn't want to disturb them so did not really try to look inside, but carefully stuck my finger in the nest and could feel several warm little eggs. As recently as last evening I could feel the eggs. This morning I took the camera out to try and take a picture of the eggs and when I peeked inside a little fuzz ball peeked back at me. 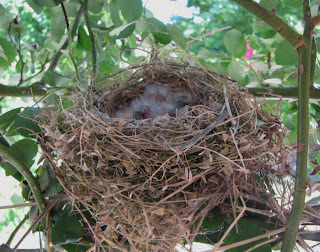 I took a couple of photos but am not sure how many babies there are or even what kind of bird it is. Some sort of sparrow I think but we will keep an eye on them. It is the season for baby birds of all sorts. Water spouts up out of holes in a grid pattern but moves from one spout to another. 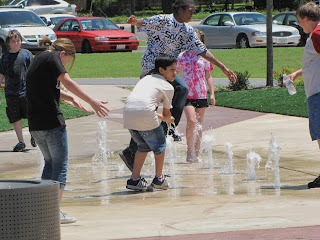 The kids were trying to jump on the water as it changed from place to place. 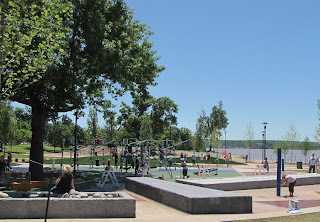 The playround area at the new 41st Street park has lots of things to climb on and splash in. The park on Riverside at 41st has been completely redone. Workmen are still planting trees and finishing the landscaping. While we were there several men were rolling out a non-slip coating on sloping walkways. The city is doing a first class job on this. 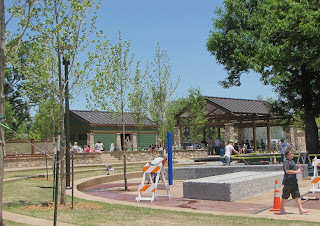 Where there might have been a few people there before, now there is a crowd - seniors eating a picnic lunch in the pavilion, people walking their dogs, moms watching their kids play on the swings and splashing in the water features, lots of people enjoying a beautiful day. A number of kids wandered over to pet Smokey. He had a nice time. We will be back. I know I said no more flower pictures for awhile, but these are SO pretty. 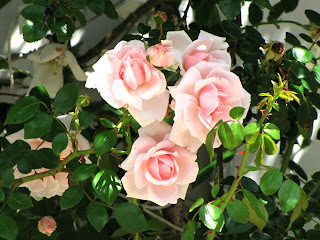 The individual roses are a lovely soft pink and are even fragrant. The Climbing New Dawn has been around for a long time. It has taken over the corner of our garage. I have the old climbing Red Blaze on the front porch and this one on the garage. I took a start of this from a bush that was on an old house that had been abandoned for demolition. I knew what it was because my mother had one when I was a kid. Someone gave her a start that she planted next to a little woodshed in the rear of our back garden. It grew so large it reached clear over the shed into the alley behind. This is a wonderful old rose. It grows on its own roots, rather than needing to be grafted to a hardier root stock. It IS the hardy root stock for a number of roses. It is very healthy and disease resistant. After an initial burst of bloom in the spring it blooms somewhat all summer and more again in the fall. People driving by will stop to admire it sometimes. We shared this feast with our friends Worth and Robbie. It was delicious! Here they are ready for our dining pleasure. On the side was a nice crisp green salad, curried rice, steamed fresh asparagus with a lemon butter sauce, and some crusty bread and butter. This would be the "before" picture. 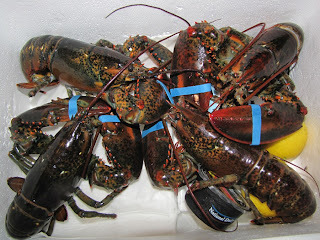 Live Maine lobsters ready for the pot of boiling water. No, they do NOT scream. They were happy to be part of our dinner. 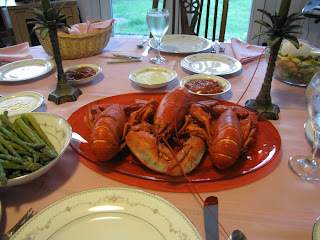 Fresh lobster is a rare treat for us. 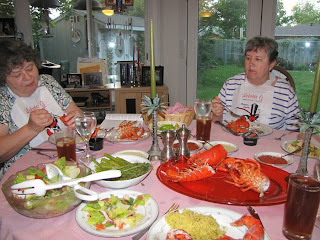 We were given a gift certificate for lobster from Lobster Gram. You tell them what day you want them and they pack them in a cold box and overnight express ship it to arrive on the day you specify. They arrive alive and in beautiful condition, ready for the pot. Included in the package are tools for cracking them over and plastic bibs to keep the juices off of your shirts. 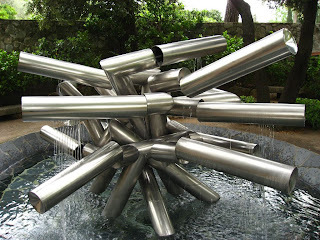 My brilliant nephew Glen has solved the riddle of the kinetic water sculpture I saw in France. It is on the grounds of the Maeght Foundation in St. Paul de Vence near Cannes. Glen sent me a link that identified it and from that Google gave me a better photograph and more information. It was created by Belgian sculpture Pol Bury. Thanks Glen. New Riverpark at 41st St.